In April 2017 Senate Bill 1 (SB 1) – the Road Repair and Accountability Act of 2017 – was passed by a two-thirds majority in the California Legislature and signed into law by Governor Jerry Brown. As the largest transportation investment in California history, SB 1 is expected to raise $52.4 billion for transportation investments statewide over the next decade. By 2018-19, MTC estimates SB 1 will generate more than $365 million per year for transportation in the nine-county Bay Area. Most of that funding will be directed to tackling the enormous backlog of maintenance and repairs for our local streets, roads and public transit systems. Funding will also be available for mobility improvements and expanding bicycle and pedestrian access. The Bay Area is also well-positioned to benefit from the new statewide competitive grant programs to reduce congestion and improve freight movement along trade corridors. Revenues to pay for SB 1 programs will come from new transportation-related fees and adjustments to state taxes on diesel fuel and gasoline. SB 1 will effectively take the state gas tax back where it used to be 20 years ago. In 1994, the base excise tax on gasoline was 18 cents per gallon, or around $3 dollars per tank of gas, as a result of the voter-approved gas tax increase in Proposition 111. 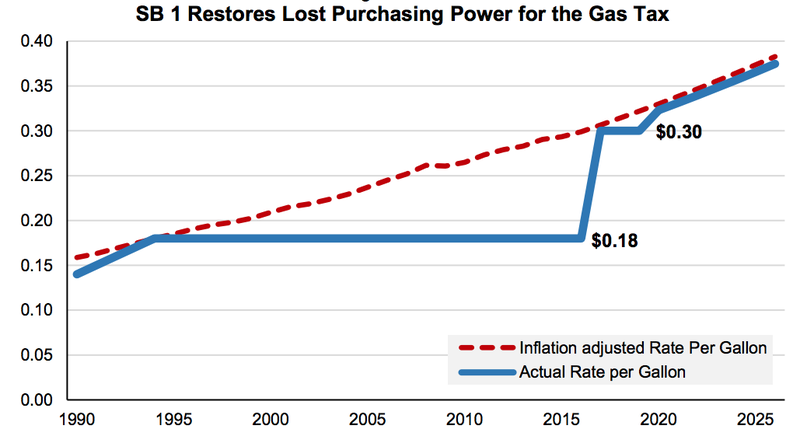 That rate has been fixed for more than two decades, even though $3 buys significantly less maintenance and construction than it did in the 1990’s. SB 1 sets the excise tax on gasoline at 30 cents per gallon – equivalent to what 18 cents in 1994 would be worth today. The second part of the state gas tax is a price-based excise tax, which SB 1 sets at 17.3 cents per gallon beginning in 2019 – precisely where it was set when the gas tax swap was enacted in 2011. SB 1 eliminates the yearly adjustment based on the price of fuel, which has resulted in wild swings from a high of 21.5 cents per gallon in 2013-14 to a low of 9.8 cents per gallon today. Where Will the New Money Go? For a detailed overview of SB 1, including the transportation programs and revenue sources, click here. A “Program Matrix” can be found here. This Program Matrix provides a breakdown of annual statewide funding and expected Bay Area funding for 2018-19, along with directing agencies, the distribution basis for funds, revenue sources and effective date(s). Various funding estimates for Bay Area cities, counties and transit operators can be found here. $250 million for local transportation planning grants.